ThirtyFifty has been running wine tasting courses in Bristol since 2004 and for 2018/2019 we have teamed up with Browns Brasserie on Queens Road, centrally located in Bristol. There are regular mid-week Evening Wine Tastings that you can attend as well as our popular One Day Wine Courses on Saturdays. The wine tastings are educational yet fun and very sociable, so that you can learn about wine in the company of like-minded wine drinkers. We can also host our wine tasting events for private groups or corporate wine tastings at various venues in Bristol. Wine Tasting makes a perfect gift experience. You can purchase an open dated gift voucher so that a date can be book after your gift has been received. The voucher will be emailed automatically as soon as you have completed your purchase. If you prefer, we have printed gift vouchers that we can post to you for £2 (select at checkout). Join us for a brilliant day out, tasting 16 wines and enjoying a 3 course lunch. All our One Day Wine Courses are run on Saturdays, starting at 10.30am and finishing at 4.00pm. Numbers are restricted to a maximum of 14 so there is plenty of opportunity to get to know other attendees and ask questions. The tasting is perfectly pitched at both novice wine drinkers and seasoned wine enthusiasts with a bit more knowledge, so that everyone will enjoy and get plenty out of the day. 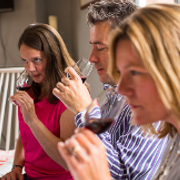 Our Bristol wine tasting evenings are both refreshing and fun, but also easy for budding wine enthusiasts to get a solid grounding that will help navigate the world of wine with confidence. In addition to tasting some delicious wines there are platters of antipasti to tuck in to for a light supper. Not found what you are looking for? Register your interest in attending a wine tasting event in Bristol by completing the form below.